Once upon a time–feminist wimmin scientists say this, so it must be true–Europe was inhabited by peaceful, gentle, farming communities, supervised by women, goddess-worshiping, who knew neither warfare nor violence. But then along came Mr. Man with his violent, warlike, patriarchal Indo-European nastiness and screwed the whole thing up. Eventually the gentle, peaceful goddess-worshipers were reduced to little pockets of non-Indo-European groups like Basques, Etruscans, and several others. Only a few have survived to this day. That lost utopia is now called “Old Europe” and serves as a kind of feminist Golden Age. Hey, remember the Ice Man? The guy who died some 5,300 years ago and wound up frozen in a glacier in the Alps, to be dug up and studied in modern times. 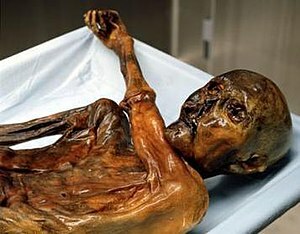 The Ice Man is the genuine well-preserved dead body of a person who actually lived in Old Europe. In fact, his is the only well-preserved body left to us from that age. And guess what: it’s the body of a murder victim. Yup–“Otzi” died from a hard blow to the head and an arrow that pierced one of his arteries (https://www.livescience.com/37311-otzi-iceman-death-clues.html). So, 100% of the bodies we have recovered from Old Europe are those of murder victims. Does that mean theirs was an incredibly violent society, wherein the No. 1 cause of death was murder? Maybe poor Otzi was iced by transphobes who snuck in from Indo-European country. Or by time-traveling Republicans. Meanwhile, the whole potentially fascinating study of “Old Europe” has been deeply tainted by feminist fantasy, maybe beyond repair. Guess I’ll just have to study something… well, real. This entry was posted on Monday, October 8th, 2018 at 10:23 am	and tagged with "Old Europe", cultural musings, feminist science, goddess worship, Otzi the Ice Man, science and politics and posted in history. You can follow any responses to this entry through the RSS 2.0 feed. According to the feminist worldview, men make war and the women make peace and children. Of course they ignore that women have killed more babies through abortion, than all the casualties of World War 2 combined, and that’s just in the United States alone. I’ve never heard of the Iceman before. Interesting information. There’s tons of info available on him. He’s been very extensively studied. You’ve hit upon an important point; people are trying to find a Golden Age, when all was hunky dory. Then, all you have to do is magically attach the values you wish to promote to that mythical Golden Age and voila, you’ve justified your cause and, slayed all of your enemies and won the battle. There’s just one little problem, these Golden Ages are assumed, not proven. Most of human history has been pretty damn ugly. There may have been limited cases of people that lived the good life, but usually that happened on the backs of slave labor; which is to say that for every person living the good life, there were lots of people living very unpleasant lives and with little or no prospect of improvement. There was a Golden Age, before the fall of mankind, but throughout history, most people were merely surviving. The relative comfort we live in today is a fairly recent development, and as we can all see, it’s not free of problems. You have to watch out for those time-traveling Republicans, always trying to make a buck and brag on the free market system. The Feminist fantasy is about as crazy as the Egyptian one in which the pharaohs were really black people and they are the ones who invented everything. Thought this was interesting . . Stunning! Between the archaeological discoveries and current events, I can’t help but believe that the focus will be more and more upon Jerusalem.